In the wake of a devastating business failure and personal crisis, Tamela Rich decided to ride a motorcycle across the country (and back) to help heal her soul. She aligned herself with a group of women motorcyclists who raise money for cancer causes, strapped a pink bra to her windshield, and set off for her first road trip. 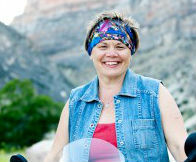 Along the way, Tamela met strangers and made new friends who shared their cancer stories. On the trip, Tamela realized that she had spent her first 40 years "overpacking" in all aspects of her life (including loading herself down with several educational degrees that she’ll be repaying for the rest of her life). Since that first road trip, Tamela now packs just enough. She calls her philosophy “mindful minimalism." Tamela recently moved from the suburbs to urban housing, and now blogs about the difficulty of downsizing her home as compared to living on a motorcycle for weeks at a time. You can read more about Tamela’s road trip in her 2011 book Live Full Throttle: Life Lessons From Friends Who Faced Cancer. What does “the good life” mean to you? And how did you come to this vision? A good life is a balanced life. With balance, you have time for meaningful relationships, physical and spiritual needs, and your intellectual and creative pursuits. A balanced life includes a component of service to others, too. An important component of “my” good life is the ability to travel and explore this magnificent world of ours. Since I no longer have a home and yard to maintain I have more time to travel. What’s the one thing you enjoy most about your lifestyle? I am freelance. I write my own blogs, newsletters, podcasts and books as well as writing for clients. In this career I don’t have dissonance between my values and what I have to do to make my living. I struggled with that when I worked in financial services and when I owned the industrial cleaning company that failed in 2007. Is there anything at all about your life these days that you really wish you could change or improve? Lots of things. Life is about making continual progress; we never “arrive.” I have a refrigerator magnet from comedian Marilyn Grey that reminds me: “No one ever has it ‘all together.’ That’s like trying to eat ‘once and for all.’"
One thing I am consciously working on this year is my relationship with my body. Middle age throws lots of things at us—physically, and in many other facets of life. I’m practicing Emotional Freedom Techniques (some call it “tapping”) to remind myself that my body is performing really well, considering everything it’s faced with, and to thank my body for carrying me through this life. Like many women, I spent most of my life at odds with my body and that has not served me well. It’s time for a different approach. Tell us a little about the work that you do. I mentioned my work as a writer, and I also think of myself as an explorer. I am a road tripper, traveling six to eight weeks each year. I discover fascinating places, people, subcultures, and natural phenomena and wring the life lessons out of them. The best part of my work is sharing those life lessons with my community through publishing (blog, book, podcast, traditional media) and in my speaking engagements. I am also a ghostwriter for business professionals, which harnesses my business background and education. I especially enjoy leading writing retreats and mastermind groups with clients, which is a creativity midwifery practice I find gratifying. Describe some ways that you are involved in your community. I am an elected member of the Spiritual Assembly of my Baha’i community, which numbers about 300 in Charlotte, North Carolina. Our global faith community does not have clergy or ecclesiastics. Rather, we use an administrative framework provided by the prophet-founder of our faith, Baha’u’llah. Working with the eight other members of our Local Spiritual Assembly, we minister to the spiritual and material needs of our community and the community at large. We are not paid for the services that we render. For many, your lifestyle is considered “outside the mainstream.” Does this present any challenges, and, if so, how do you deal with them? No—my lifestyle is slightly different, but I find that most people are looking to make changes to their lives. Everyone has a lot to learn and share, myself included. Some people are shocked to learn that I moved to an urban neighborhood from the suburbs, but I read a report that by 2011, America’s suburbs held 3 million more poor people than reside in our core cities. I can see how that came to be, as a new urban dweller. All the services I need are pretty close at hand, including a farmer’s market—a quick three-block walk. If we didn’t have a car in the suburbs, we would have walked a couple of miles each way to the grocery. Car ownership in the ‘burbs is both a necessity and a millstone. We live near a community bicycle co-op and light rail line and city busses are plentiful. This means we don’t have to spend $9000 a year to drive 15,000 miles, as the average American does (according to AAA). Yes, we have two cars between the three of us, but they don’t get much use. The other thing about my lifestyle that invites questions is how I “get away with” traveling solo for long stretches of time as a married person. Some people are even surprised to learn that I’m married, given my work. My response is that in an affirming relationship, each partner has to give the other room to be their true self. Matt and I have that kind of relationship; we’ll be married 30 years this September. Please describe any new skills or hobbies that you’re really excited about or that you would love to learn if you had the time and resources. I am really excited about trading worm castings for produce at the local farmer’s market and about growing some herbs and beans on my patio, supplemented by “worm casting tea” and the worm castings themselves. I have always been a knitter, my grandmother taught me the craft, but I’d like to take a pottery class some day. North Carolina is home to some of the world’s best pottery clay and potters. We’ve all heard that what doesn’t kill you will make you stronger. When I was going through the failure of my business and the mental health crises that ensued, a friend told me something I’ve come to believe: the hardships that don’t kill us also have the power to bring us to a wiser, more compassionate, more spiritual state of being. New Dream's "Living the Dream" series profiles folks from around the world who are living lives focused on “more of what matters.” If you or someone you know is living the New Dream, please contact us—we're looking for inspiring stories to share!